In a David and Goliath-style clash between two of Australia’s most venomous beasties, a redback spider rose triumphant over a much larger eastern brown snake – a critter that can kill a human in just a few hours. If you’re small, being equipped with a mighty dose of venom can come in pretty handy. The bizarre scene, which will haunt the dreams of arachnophobes and ophiophobes alike, was captured on camera by Robyn McLennan at a vineyard in Victoria. She then posted her photos to the Field Naturalists Club of Victoria on Facebook. “Her eyes are definitely bigger than her belly!” one member commented. “Now THAT’S an ambitious redback! !” wrote another. After originally posting her photos, Robyn added an update: “The spider has now brought the entire snake off the ground and it is suspended mid-air, just under the lower lip of the tank.” Yikes. Strangely enough, redbacks taking on snakes isn’t all that uncommon. Female redback spiders are larger than males, growing to around 1 centimeter (0.4 inches) in length (legs not included). They are black with a characteristic red or orange streak across their back, while the diminutive males are light brown with white or yellow markings. Only the females are capable of biting humans, as the males’ fangs can’t break through the skin. Although a bite can be very painful and cause symptoms like nausea and sweating, it is rarely dangerous. However, for children and pregnant women, it can be life-threating. Therefore, it’s perhaps not all that surprising that a female redback can kill a snake, particularly a young snake like the one in the photos, which would have been more susceptible to the spider’s venom than an adult. In addition to their toxic venom, redbacks, as well as other members of the genus to which they belong, spin impressively strong and sticky webs to ensnare their prey. The silky threads are covered in tiny super-sticky droplets of glue that the spider secretes via a gland. 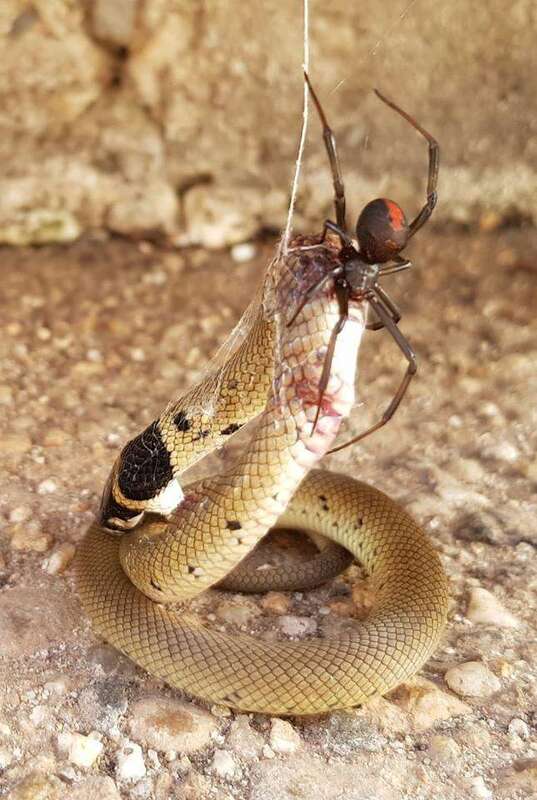 While the fact it killed the snake might be gruesome enough, you might also be wondering how a little redback spider might go about devouring its overwhelmingly large prey. Through biting, the spider injects digestive enzymes that break down the snake’s body tissues leaving a delicious soup for it to consume. Full-up on snake juice, the spider can then go weeks without eating. If you want to see a spider vs snake battle in action, check out this video taken in 2017 of a stealthy redback ambushing a wriggling snake.